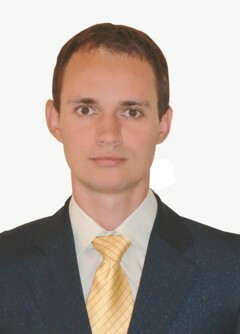 Igor Borisovich Furtat was born on the 13th of July, 1983 in Nikolaev, rep. Ukraine. He graduated from the Astrakhan State Technical University (ASTU) with the specialty Astrakhan State Technical University (ASTU), Chemical Engineering Department) with red diploma. From 2006 till 2011 he worked at the Department of "Mathematics in Engineering Education" ASTU. He received a Candidate of Engineering Sciences (PhD) in ASTU in 2006 and the title of associate professor in 2011. He has been working as a senior Researcher in the lab "CCS" IPME RAP since 2011. Research interests: adaptive, robust, optimal control, control of dynamic networks. I.B. Furtat is the author of over 50 publications including one monograph. Parshev E.A., Furtat I.B., Tsykunov A.M.
Adaptive and robust control. Decentralized systems. LAP LA.M.BERT Academic Publishing, 2011. - 328 p.
Proceedings of the universities. Priborostroenie. - 2005. - N 7. - P. 15-19. Devices and Systems. Command, control, diagnostics. - 2006. - N 8. - P. 15-17. Mechatronics, Automation, Control. - 2006. - N 8. - P. 2-7. Control. - 2008. - N 5. - P. 2-7. Mechatronics, Automation, Control. - 2008. - N 11. - P. 2-7. Proceedings of the universities. Priborostroenie. - 2009. - N 5. - P. 21-26. Mechatronics, Automation, Control. - 2009. - N 7. - P. 7-12. Mechatronics, Automation, Control. - 2009. - N 10. - P. 2-7. Galyauv E.R., Furtat I.B., Tsykunov A.M.
Devices and Systems. Command, control, diagnostics. - 2010. - N 2. - P. 22-25. Industrial Control Systems and Controllers. - 2010. - N 3. - P. 16-19. Mechatronics, Automation, Control. - 2010. - N 4. - P. 10-16. Automation and Remote Control. - 2010. - N 6. - P. 109-118. Mechatronics, Automation, Control. - 2011. - N 4. - P. 12-18. Gushchin P.A., Vinokurov V.A., Furtat I.B. Oil and Gas Technology. The Science and Technology journal .- 2011. - N 3. - P. 36-40. Control of large systems. Issue 33. - 2011. - P.91-112. Automation, telemechanization and communications in the oil industry. - 2011. - N 7. - P. 29-32. Control. - 2011. - N 4. - P. 46-52. Mechatronics, Automation, Control. - 2011. - N 9. - P. 8-13. Proceedings of the universities. Priborostroenie. - 2011. - N 9. - P. 22-27. Proceedings of the Academy of Sciences. Theory and control systems. - 2011. - N 5. - P. 102-108. Information-control systems. - 2011. - N 5. - P. 23-30. Automation and Remote Control. - 2011. - N 12. - P. - P.104-114. Furtat I.B., Fradkov A.L., Tsykunov A.M.
Proc. 18th IFAC World Congress on Automatic Control. Milan. - 2011. - P. 1255-1260.